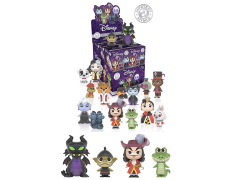 Funko's Mystery Minis villains series highlights the most evil characters from Disney's rich history and their companions! This set features classics like Maleficent and her pet raven Diablo, Ursula and her moray eel minions Flotsam and Jetsam, the Red Queen with White Rabbit, and Cruella de Vil with Patch! Prince John and his confidant Sir Hiss, Shan Yu with Hayabusa the Falcon, and Dr. Facilier accompanied by his Voodoo doll round out the set. Also, in this exclusive set you can find four additional figures of Captain Hook with Tick Tock and Maleficent in Dragon Form with Goon.